So when was the last time you saw a pellet tree? We all know that closer to natural, raw and unprocessed we can get with the food we feed our pets, the healthier and longer they will live without illness. This also rings true for our feathered friends. Since I owned my very first African Grey Parrot, I researched their natural diet and decided right from the start that I would feed my feathered friend as close her natural diet as possible. Seeds and nuts are indeed a natural food for most birds in their natural habitat so giving your birds seeds and a few nuts ( depending on the species ) should be still available in a smaller % of their daily intake. As humans, we just find it more convenient and easier to give manufactured bird seed. If we can begin to incorporate just small amounts daily of fresh, organic raw fruits, vegetables, seeds, nuts and legumes, we will be doing our birds a huge service helping them stay hardy, healthy and vibrant in color. The benefits are absolutely amazing for our feathered friends. One of my favorite companies that helped me get started on healthy fresh foods and supplements for birds was a company called “China Prairie” located in the US. I am a long time customer! 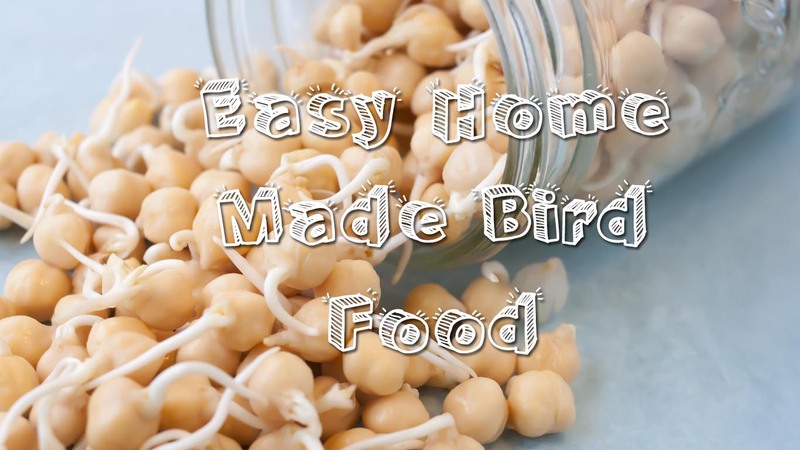 If you have the ability to order your first kit from them you won’t regret it and later as you get the hang of sprouting and cooking for your birds you will discover how quick and easy it is to incorporate into your daily routine. Many recipes can put into containers and frozen and defrosted daily for your birds. Most birds take to the food right away and some birds take a few days through consistently offering some in a separate dish daily. If ordering an initial kit from China Prairie is not practical for you, you do have an option by purchasing some of the ingredients yourself and learning how to sprout the legumes and seeds in mason jars at home ( just use a sharp object to create breathing holes on the top of the lid for draining and air flow ) I purchase my food products at BULK BARN and then mix all ingredients in a very large storage jar that I keep in the fridge. I mix well all the beans, legumes, seeds together and then scoop out to gently boil for 25 minutes, strain and cool then I sprinkle with either Avian Powder Vitamin mix from PetSmart – or I will use FRESH ADDITION supplement available at China Prairie. Remember to take any uneaten food away after 4 hours and sooner in the warmer/summer months as it can spoil quickly. Here is a list of ingrediants you can find at BULKBARN and please choose ORGANIC where ever possible. Note, that most birds/parrots will enjoy this mix no matter their species or size. You can avoid certain food items that your bird doesn’t like, however, it is always recommended to continue to serve foods they may not like as many birds often “give in” after days or weeks of being consistent. Hulled sunflower seed – organic, no shell, no salt, no roasting, raw only. If your purchase a SCOOP of each of these items the cost will be about $30-$45 and will last many months KEPT IN FREEZER. I would suggest mixing all seeds and legumes together in one huge bowl then keep a week’s supply in the fridge for daily cooking/sprouting and the rest seal and put into the freezer pulling out as you require for a week at a time. You can cook daily which birds LOVE. and/or you can sprout the mix. You will require a few large mason jars which can be purchased at your local Canadian Tire or Walmart Store. Take the lids and carefully puncture many little holes through the top. I use a star screwdriver. You want the holes to be big enough that water can drain from the lid but without losing the contents and also for air to flow through. You may also be able to find special lids for the mason jars that are specifically made for sprouting. Put the jars and lids through the dishwasher to rinse can clean well or soak in hot soapy water and rinse well and let air dry. Bird Care – What Is Safe?